In a large punch bowl, pour limoncello and 7UP™. Place scoops of sherbet on top. Garnish with lemons and blueberries. Serve with a large ladle and enjoy! Save time with pre-scooped sherbet! Simply line a large cookie sheet with parchment paper. Place scoops of sherbet on the parchment, then freeze until ready to use. Party punch just doesn’t get any prettier. My mama was a big time party thrower. She was always looking for excuses to toss out a tablecloth, slide into a cocktail dress, and shimmy through a room full of women squealing, “What a party this is!” and “How do you come up with such clever ideas? !” Long before Pinterest, my mom was a pinner of ideas. She rifled through women’s magazines on the lookout for to-die adorable treats. She had folders full of tried-and-tested crowd pleasers. And she prided herself on being able to pull together a stunning affair in a matter of minutes. One of her wow-able ideas was sherbet party punch. Oh, sure. It doesn’t sound like a novel idea now, but in the 1970’s, dropping sherbet into foamy soda and serving it all with a scoop was pure brilliance. The ladies of the cul-de-sac oohed and ahhhed as they sipped little cups of chilly pink punch. Sherbet punch is a classic. And now, it’s also a boozy new wonderdrink. Because this recipe takes everything that everyone once loved at parties, pours a bottle of limoncello into it all, and turns out a light and frothy party punch. I made it today and found it irresistible. Perfect for summer potlucks, baby showers, and even weddings, I think this simple twist on sherbet punch would make my mama proud. After spilling my guts about Party Mom Extraordinaire, I’d be remiss to share this recipe without letting you on the ultimate easy party hack. Before you make this punch, grab an ice cream scoop and place scoops of sherbet on a piece of parchment. Freeze until ready to use for extra-firm, ready-to-go sherbet that simply has to be plopped into your punch bowl! Fill your bowl with limoncello, then add just enough soda to fill the punch bowl a little more than halfway. Add your pre-frozen sherbet scoops, then fill to the top with 7UP™. If you add the sherbet first, you’ll be left with a wild hunk of bubbles. So: Soda before sherbet for a beautiful bowl of punch! 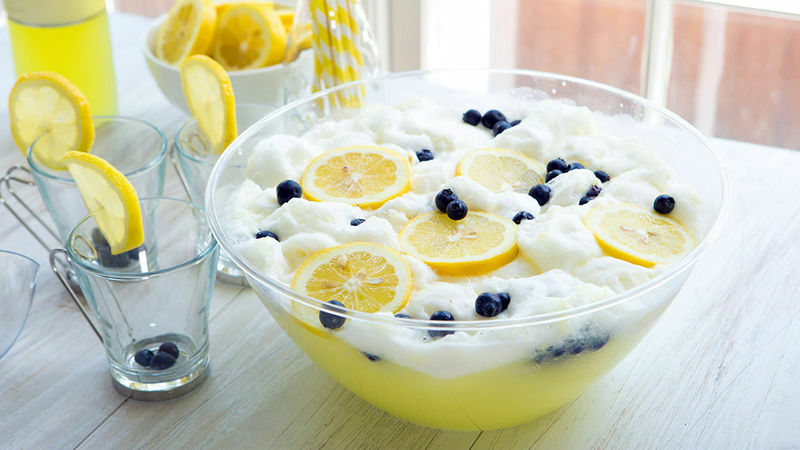 Float slices of lemons on top of the sherbet, sprinkle with a few blueberries, then stand back and admire. Grab a big ladle, scoop cups of punch, and enjoy that refreshingly sweet goodness. Call in the party crew. It’s time to party!